Voting is the fundamental right of every person living in a free and fair democracy. Voting is ensuring that the popular vote of the people is heard. Electing the government is your right as a citizen of your country. It is imperative that every eligible voter from every village, town, district, city, and state vote to keep the power in the hands of the people. If you do not vote, you have no standing when it comes to criticizing the government. Elections are held every year in different parts of the country but elections to choose your representative are held every 5 years. Voting is to democracy what breathing is to the human body, you can choose not to do but it come back and leaves you powerless. Rajasthan is the largest state in India area wise and holds 25 Lok Sabha Seats and 200 Legislative assembly seats. The elections in this state have an impact on the state of the country. The Election Commission of India is a free and autonomous organization that supervises all the election that happens in the Republic Of India. They have jurisdiction in all aspects of every election whether it is a Parliamentary, State, or the election of the President or the Vice-president of India. It is their duty to conduct elections in a fair and free manner as outlined in the constitution of India. Go to http://nvsp.in/. This website has been created to register voters nationally by the Election Commission of India and has been created with the people in mind so that it is user friendly and the common man can resister without many problems. Scroll down and click on the ‘apply online for registration of a new user link’ and you will be re-directed to FORM-6. Fill in the form with all the pertinent details and attach a scanned copy of your passport sized photograph with your form. 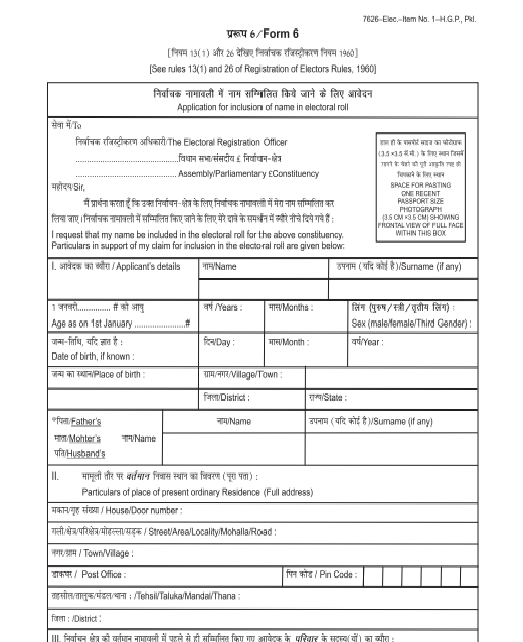 After successfully completing your form, you will be provided a registration number and with this the online part of the registration has been completed. Hard copies of the documents that denote address proof and age proof are to be provided to the nearest Election Registration Officer. Your details are to be verified and after the successful completion of a home visit, you will be issued a Voters ID. The voter Id can only be collected by the person to whom the card is issued to.